East Poultney Day, a celebration of Poultney’s rich history, is the premier event of the Poultney Historical Society. Always held on the second Saturday in August, this year’s event will be on August 11, 2018 from 9 AM to 3 PM on the East Poultney Green. The day will feature Vermont Humanities Council sponsored lecturer Deborah Lee Luskin as East Poultney Day’s 2018 keynote speaker! Luskin’s presentation Getting from Here to There: A History of Roads and Settlement in Vermont will take place at 11am the day of the event! For more details about her presentation, click here. The original event in 1935 was a commemoration of the role of Poultney citizens in the Battle of Bennington and the extraordinary bravery of the “Valiant Thirteen”, Poultney women who, during the Revolutionary War, fled their homes in Poultney before Burgoyne’s advance after the Battle of Hubbardton to seek the relative safety of the Bennington area. The event has evolved into a full day of activities on-the-green in East Poultney for the entire family to enjoy. 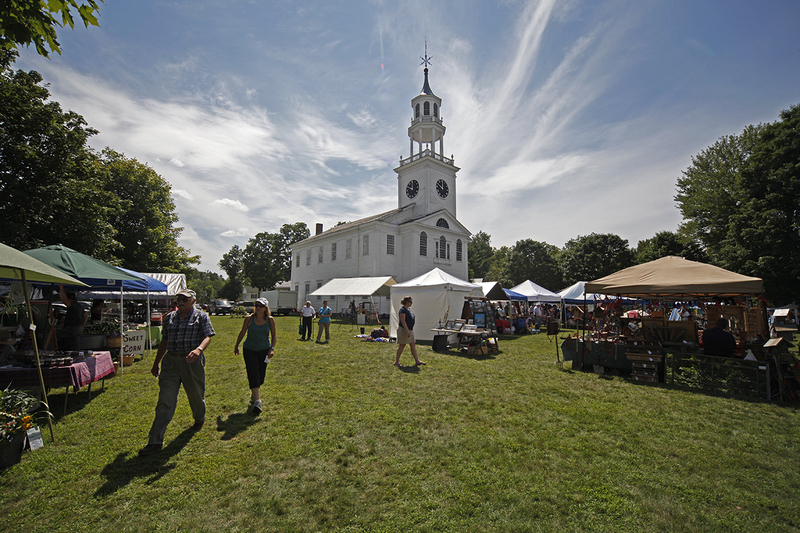 Throughout the day, 50 juried vendors sell crafts and folk arts, antiques and collectibles, maple syrup, jams, herbal soaps, vintage linen, handmade pottery and jewelry. Throughout the day, there are demonstrations of beekeeping, rug hooking, spinning and weaving. Visitors often enjoy living history experiences as an 18th Century schoolmaster conducts class in the 1791 Union Academy (Vermont’s second oldest school building) while a British Army Regular periodically disturbs the peace with musket fire. On a corner of the green, Green Mountain College’s Cerridwen Farm displays live animals, including sheep and oxen, and offers fresh produce, eggs and flowers. Visitors can participate in shape-note singing, choral music originally taught in Vermont by itinerant music teachers in the late 18th and early 19th centuries, or join in contra dancing with a caller and live music. Scheduled at various times during the day are historical programs, musical concerts, including a brass ensemble and a double reed quartet, and demonstrations of melodeons made at the Melodeon Factory Museum in the 1850’s. Food is available all day long, provided by the Poultney Snowmobile Club and the East Poultney Store. Visitors can help support the work of the Historical Society by becoming members and buying raffle tickets. A traditional Vermont church supper follows at 5 p.m. in the basement of the Baptist Church, built by Elisha Scott in 1805. For more information contact 802-287-5252 or inquire at [email protected].